Posted March 11th, 2018 by Mike Boyes & filed under Group Processes, Industrial Organizational Psychlology, Industrial Organizational Psychology, Interpersonal Attraction Close Relationships, Personality, Persuasion, Social Cognition, Social Psychology. Description: You have, do doubt, encountered toxic people in your life. Even without labels, you know the sorts of things they do – manipulating social situations, taking advantage of others, particularly when the others are honest and humble, or currying favor with those in charge. 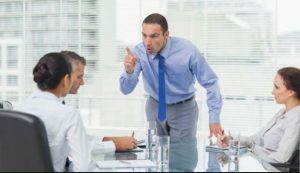 In day-to-day life you can often simply walk away from such people and decide to not have any more to do with them, thus saving yourself the challenges of interacting with a toxic person (personality). But, in a workplace setting where the toxic person is in a position of authority within your organization, your options are more limited. And, how is it possible for someone with a toxic personality profile to end up in a position of authority, to have been promoted? Good question! Have you heard of the Dark Triad? (I have blogged about it previously). Within personality, the Dark Triad consists of a tendency to exploit others (Machiavellianism), little or no feeling or regard for others (psychopathy), and a strong drive to be the center of attention (narcissism). Quite a combination. Think about how someone with this lovely sort of personality trifecta might fare in organizational settings (how they would actually fare and not how you think they should deserve to fare) and then read the article linked below to see what research says about these matters. Source: Why Toxic People Get Ahead: New research shows how toxic people manage to take charge and rise to the top. Susan Kruass Whitbourne, Fulfillment at Any Age, Psychology Today. It is perhaps a somewhat depressing set of results in that it seems that toxic people, high on the Dark Triad of traits, are able to utilize them as a form of political skill to move upwards in organizational settings. Honesty and humility ARE linked to rewards for team facilitation skills in organization settings, but this is an alternative pathway to advancement. Those high on the Dark Triad, the researchers suggest, possess a set of skills that, while not pretty, are sometime needed within organizations. Sometime difficult and even ruthless things need to be done and those who are equipped to take them on and accomplish them are rewarded with organizational standing. SO, as the researcher suggests, if you ARE honest and humble consider honing your political savvy and enter the impression management game. Or, became a consummate team player as that can be a road upward as well. What does the dark triad consist of? How do those scoring high of the Dark Triad traits succeed in organizational settings? Is this just inevitably the way things are in the world and in organizational setting or are there other ways that we might proceed? Templer, K. J. (2018). Dark personality, job performance ratings, and the role of political skill: An indication of why toxic people may get ahead at work. Personality and Individual Differences, 124, 209-214.